For use primarily in residential wiring, including branch circuits for outlets, switches, etc. May be installed in both exposed and concealed work in normally dry locations. May be installed in air voids of masonry block or tile walls where these walls are not subject to excessive moisture or dampness. May be installed in locations with temperatures up to 90°C, but with the ampacity limited to that of 60°C conductors. Added Circuit: For use primarily in residential wiring for branch circuits supplying outlets located in bedrooms and other areas. Has two separated neutrals so one cable can be used to run two circuits when sharing of a neutral is not allowed. 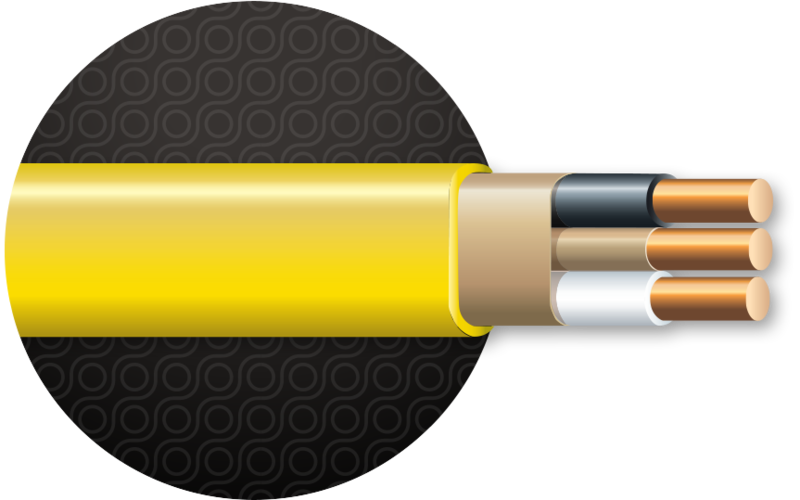 PVC-jacketed cable with two-, three- or four-circuit conductors and an equipment grounding conductor. Intended for use in accordance with the National Electrical Code®. Two-conductor constructions have the insulated conductors laid parallel. The ground wire is wrapped with fire-retardant paper and laid parallel between the insulated conductors. The entire construction is wrapped with a paper separator before applying the jacket. Three (or more) conductor constructions have the insulated conductors twisted together or laid parallel to each other. Ground wire is wrapped with paper and twisted together or laid parallel to the insulated conductor.